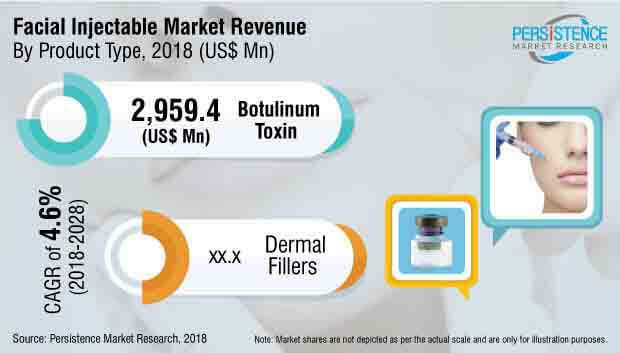 Facial Injectable market is dominated by the leading players, for example, Allergen, Merz Pharma, and Nestle skin health. These companies are focusing on new product launch in the dermal fillers and botulinum toxin products. The companies operating in the Facial Injectable market are focusing on novel innovations in terms for the product design. To expand in the Facial Injectable market, the companies are working collaboratively to produce high value products. The companies are focusing on distributor relationships in the emerging countries of Asia and Latin America region. Apart from this, many companies are entering into collaborative licence agreement with distributors for the increasing product reach across regions. Many of the early age patients and male patients population are opting for aesthetic procedures like lip augmentation, acne treatment, face lift, scars treatment and aesthetic procedures. These are the most common type of facial aesthetic procedures which requires facial injectable. As per AASPS study, 9.0% of the total aesthetic procedures performed in 2015 were by male patients. Many early age patients also uses facial Injectable for the wrinkle removal which is expected to drive the growth of facial Injectable market over the forecast period. Popularity of facial injectable treatment for the reduction of skin folds, smoothening of the skin, enhancement of lips, wrinkle removal, acne treatment and scars treatment and other applications is boosting the adoption of facial injectable in the market. After research, the use of facial Injectable for the treatment of paralyzed vocal cords is under consideration for approval from the US FDA which is expected to increase the growth of facial Injectable market. Many companies are following the physical engagement strategy to increase their product reach among end users. This has also reduce the threat from the new entrants in the facial Injectable market. Many dermal filler aesthetic manufacturers have started with the continuous physician learning programs at regional level to increase the product awareness among end user. Many of the patients have adverse effects due to excessive usage of dermal fillers or botulinum toxins, and to keep the track on this, companies have started direct interactions and engagement with patients. The continuous learning on new techniques and developments and new user registrations through educational and awareness programs for their engagement are expected to drive the growth of facial Injectable market. Increasing demand for facial Injectable, favorable support from the government in terms of product approval for the new application areas, commercialization of novel solutions in the market are the factors boosting partnership, collaborations, mergers and agreements between facial Injectable manufacturers. Aesthetic product manufacturing companies are continuously focusing on increasing product reach in the Asia market due to growth in cosmetic tourism across region. As a result, companies are adopting distribution agreements as expansion strategy to gain maximum revenue from the facial Injectable market. Some key manufacturers are also collaborating with other aesthetic companies other than facial Injectable providers to capture new markets and to give competitive advantage to the patients. Increasing number of plastic surgeons and their network is driving the demand for aesthetic procedures and which in turn is boosting the facial Injectable demand. Also, there was FDA approval for the use of facial Injectable by other physicians such as dentist in their practices. As dentists come across many cases who requires facial changeover after the dental treatments, can now perform the facial Injectable procedures. This can be expected to increase the growth of facial Injectable market. The competition section of the report features profiles of the key players operating in the facial Injectable market based on their market shares, development strategies, product line, marketing strategy and company dashboard. Examples of some of the key players featured in this report include Nestle skin health, Sinclair pharma, zimmer Biomet, Allergan, Anika therapeutics Inc., Merz Pharma, Ipsen, Teoxane laboratories, Prollelium Medical Technologies Inc., Suneva Medical Inc. and others. Nestle skin health and Allergan offer a range of products for facial Injectable, which include various types of dermal fillers. Zimmer Biomet is involved in manufacturing of dental facial Injectable which mainly include prosthetic products and dental implants. The key manufacturers of facial Injectable are focusing to develop new high quality products. The companies are focusing on to expand their presence in the emerging markets and also to maintain strong distributer relationships. Facial Injectable are the face skin fillers which are used in many applications like dark circles removal, uplifting of eyebrows, thinning of the lips, enhancement of cheekbones and others applications .Facial injectable are also used to reduce wrinkles and smoothen skin appearance caused by ageing, acne or scars. The major application areas are face including Nasolabial fold, cheeks, lips, corners of the eye and for enhancing appearance of dorsal area of hands. There are two major types of facial Injectable namely botulinum toxin and dermal fillers. Some of the key commercially available botulinum toxin brands include Dysport, Xeomin, Meditoxin, Botulax and Nabota. Dermal fillers may be of Hyaluronic acid based, Calcium Hydroxyapatite based, Poly-Lactic acid based, collagen based or Polymethylmethacrylate-based (non-absorbable). PMR conducted a research study on Facial Injectable market for the forecast period 2018 to 2028. The facial Injectable market report offers a comprehensive evaluation of the business opportunities prevailing in the facial Injectable market along with insights on the facial Injectable current trends and their multiple applications. The report elaborates the macroeconomic factors influencing the dynamics of facial injectable market and its futuristic potential. The report offers a comprehensive taxonomy of facial Injectable market based on product type, applications, end users and region. There are two types of facial Injectable which are majorly used in the facial Injectable market. Two types of facial Injectable are dermal fillers and botulinum toxin. Dermal fillers are injected with small gauge injectors into deep dermal area to fill the space and also to induce the body production of collagen. Dermal fillers may be of Hyaluronic acid based, Calcium Hydroxyapatite based, Poly-Lactic acid based, collagen based or Polymethylmethacrylate-based (non-absorbable). Botulinum toxin is a single chain of about 150KD and then is cleaved to form a dichain molecule with a disulphide bridge. Some of the key commercially available botulinum toxin brands include Dysport, Xeomin, Meditoxin, Botulax and Nabota. There are various applications of facial Injectable including aesthetic restoration, dentistry and reconstructive surgery. Aesthetic Restoration is expected to hold large share in the facial Injectable market. End-use segments in facial Injectable market include hospitals, specialty clinics and beauty clinics. The facial Injectable market has been analysed across regions, namely North America, Latin America, Europe, Asia Pacific and MEA. What is the revenue potential of the facial Injectable market across regions of North America and Europe? Who are the key competitors and what are their portfolios in facial Injectable market? What are major challenges influencing the growth of the facial Injectable market? How intervention from regulatory authority is shaping the growth of the facial Injectable market? The facial Injectable market has been estimated based on supply-demand approach. A triangulation methodology is adopted to derive the market size, which is primarily based on overall expenditure on life science research funding and capital equipment installed base to obtain precise market estimations and insights on life science and biotechnology associated products, applications, technologies and services. The country-specific data is again analysed to derive data at a global level. This methodology ensures accuracy and high quality of information. The information about the installation of injectable mainly in hospitals is further validated through primary research (including interviews, surveys and viewpoints of seasoned analysts) and secondary research (including verified paid sources, authentic trade journals, and resourceful databases). With this approach, the report on the facial injectable market projects the industry attractiveness of every major segment over the forecast period.